What are the outlooks of 2018 and beyond? How can we manage this growth? How can we service the economy as connectivity, data center and cloud industry? Questions we can only answer by closely working together and sharing knowledge. 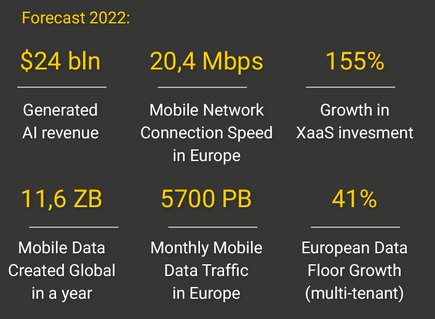 ​This KickStart Europe Outlook 2018 report provides an overview of the latest insights and trends regarding connectivity, cloud and data center. 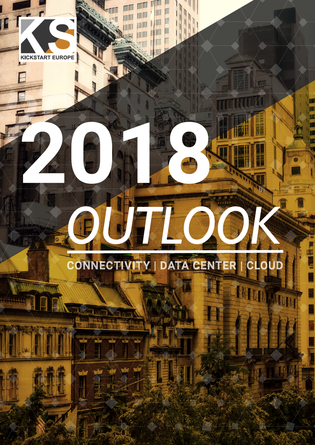 The report dives into key indicators and outlooks regarding the latest IT, business and infrastructure trends that are expected to have a strong impact in 2018 and beyond. Fill in the information below to download the KickStart Europe Outlook 2018 report for free. Amsterdam, February 20, 2018 - By the industry, for the industry. this Strategy & Networking Summit, and the key indicators of future growth. All indicators predict exponential growth is happening. Data creation and replication is expected to grow with 231% in 2022, to almost 70 ZB a year. Is the digital infrastructure industry prepared? "Only by collaborating we can prepare for the extensive growth in demand for data", says Stijn Grove, Chairman of KickStart Europe. "It is the only way in which the cloud, connectivity and data center industry is able to continue servicing the economy." To help the industry to work together, KickStart Europe was launched to kick-off the year 2018. Around 300 C-level executives, coming from 15 different countries, the industry came together to discuss future trends and investments in technology and digital infrastructure. According to IDC, the amount of zetabytes created on an annual basis will grow with almost 300% over the next five years. Mobile data creation is even growing faster, with video being the main driver. ​So there is a lot coming our way. The KickStart Europe Summit Conference is an initiative by Digital Gateway to Europe events. For more information on the KickStart Europe summit, please consult www.kickstartconf.eu or follow us on Twitter @KickStartEur. Digital Gateway to Europe is the organisation promoting the data center industry in Europe. We organize events, trade missions, trade shows, launchpads and other meetups to share information about the digital infrastructure and data hubs. Scale-ups, start-ups and enterprises who would like more in-depth information can consult our Digital Gateway to Europe knowledge database. Visit www.digitalgateway.eu for more information on our events, publications and upcoming trade missions.